Trains used to roll through Eatonville daily. In fact, ” . . . in 1913, the railroad had three passenger trains a day going through Eatonville, with observation cars. The tourist special was taken off in September, 1924, competition from busses and automobiles having interfered. 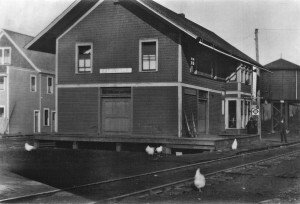 The railroad also carried the mail until July 1, 1928.” (History of South Eastern Pierce County.) If you were catching the train, the depot was on Madison, off Center street. One of the great things about this shot are the roaming chickens. Between 1911 and 1913 Eatonville passed, repealed and passed an ordinance curtailing chickens from “running at large”. Chickens at the time of this shot were still on the loose.